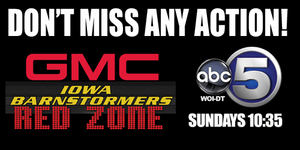 03/16/2011 2:17 PM - DES MOINES – The Iowa Barnstormers of the Arena Football League are pleased to announce that WOI-TV, ABC 5 will be home again this season to the Central Iowa GMC Dealers, Iowa Barnstormers Red Zone. The 30 minute show will air every Sunday night at 10:35p.m. throughout the 2011 Barnstormers season. Each show will feature highlights from the most recent Barnstormers game, an interview with Barnstormers Head Coach John Gregory, and segments focusing on the lives of Barnstormers players, both on and off the field. Veteran sportscaster Joe Stasi returns for his second season as the show’s host. “We are extremely excited to bring back the Red Zone television show for another season on ABC 5”, stated Barnstormers General Manager John Pettit. “We are also very happy to welcome the Central Iowa GMC Dealers aboard as title sponsor for the show”. The first show of the 2011 season will air this Sunday, March 20. The show will feature highlights from tomorrow night’s season opener in Pittsburgh along with a behind the scenes look at the Barnstormers media day, which took place last Tuesday. In addition to the Central Iowa GMC Dealers being named title sponsor of the show, the Barnstormers and ABC-5 would also like to thank our feature sponsors for this season, Bennigan’s, Capital Iowa Orthopaedics, The Chicken Coop, and Coach’s Pizza. The home portion of the schedule begins Friday, March 25 when the defending Arena Bowl Champions the Spokane Shock come to Wellmark Field. Season tickets remain on sale for as low as $117 per seat, while individual game tickets can be purchased for any regular season game at the Wells Fargo Arena Box office or by calling the Barnstormers at 515-633-2255. For all of the latest Barnstormers information log onto www.theiowabarnstormers.com.